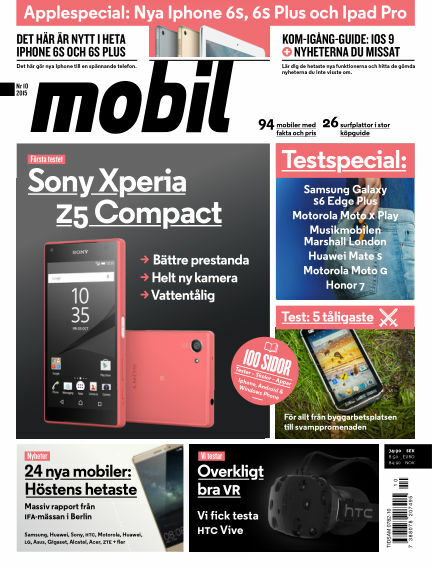 In this issue of Mobil Sverige : Första testet av Sony Xperia Z5 Compact. Applespecial med nya Iphone 6S, 6S Plus och Ipad Pro. Stor rapport från IFA-mässan i Berlin. Många fler tester: Samsung Galaxy S6 Edge Plus, Motorola Moto X Play, Huawei Mate S, Motorol Moto G, Honor 7. Jämförande test: de fem tåligaste. With Readly you can read Mobil Sverige (issue 2015-10-06) and thousands of other magazines on your tablet and smartphone. Get access to all with just one subscription. New releases and back issues – all included.